The initial lab design in Part 1 needs to be amended for this part, and that’s what labs are all about, learning and then making changes on what we’ve learnt. Note ii: The Cluster Management IP Address cannot be in the same subnet as the Cluster Network. The Cluster Administration IP address belongs to a Vserver that initially exists on the first node. Note: Notice that the DOT 8.1.2 C-Mode SIM has a thin-provisioned 250GB Hard Disk 4. The below recipe is for NACSIM101. 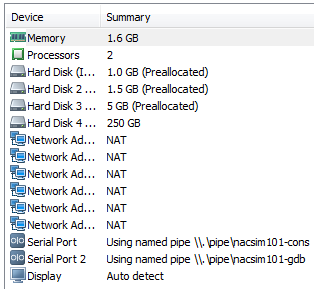 Boot the simulator – NACSIM101. When you see “Hit [Enter] to boot immediately, or any other key for command prompt” hit Ctrl-C. Enter the following commands to set your unique 10 digit serial number. Private cluster network ports [e0a,e0b]. Cluster port MTU values will be set to 1500. Cluster interface IP addresses will be automatically generated. Note: The cluster management IP cannot be on the cluster subnet! This node has joined the cluster CSIM00! Skip the bit before set –privilege advanced (except the security login unlock -username diag) as the diag password is already set in the cluster! Finally, system node halt local the simulator filers and take a VMware workstation snapshot before we get to play and break things!